Frozen water: This is one of the most common causes of a burst pipe. Frozen water will cause piping to expand, eventually leading to its inevitable demise. Clogs: Clogs inside of your home can also cause pipes to burst. A lot of pressure is placed on your pipes when there is a clog somewhere in your residence. If the pressure exerted on the pipe is too much for it to handle, then it will burst. Rust: This is another common problem that can cause a pipe to burst. Your pipes are more prone to rust as they get older. Environmental interference: Additionally, rodents and tree roots can cause a pipe to burst. A rodent can chew through certain types of pipes. A tree root can potentially cause damage by invading the pipe. Because frozen water inside of a pipe is one of the main things that can cause it to burst, one of the best things that you can do to prevent you pipe from bursting is to prevent the water inside from freezing. You will need to make sure that your pipes are insulated before the winter arrives. A pipe that is exposed is far more likely to freeze. You will also need to make sure that air leaks around the pipes are sealed. A small opening in a pipe can let a lot of cold air in, eventually leading to disaster. Furthermore, if there is a clog inside of your home, then you should make sure that it is taken care of as soon as possible. A clog can cause a pipe to burst just as easily as frozen water. What can professionals do to repair burst pipes? If you have a burst pipe, then you will need to make sure that you call a professional plumbing company as soon as you can. Burst pipes are a plumbing emergency, and they can result in serious damage. The first thing that we will do is inspect the pipe and assess the damage. This will allow us to determine whether replacement or repair is the better option. If the damage is only minimal, then we may only have to replace a small section of the pipe. If the pipe has been severely damaged, then replacement is the appropriate recourse. After we have finished repairing or replacing your pipes, we will run a test in order to make sure that everything is running as it should. The clearest sign that you need our professional drain cleaning or M.A.C. Stewart Plumbing drain cleaning is if your tubs, sinks, or toilets are running slow. This means the water is pooling and not draining out at the normal rate. A second and more serious sign that you need a cleaning immediately is if the drains stop working completely. This indicates that there is a clog somewhere in your plumbing system that needs our attention. Low water pressure is a third sign you need drain cleaning or rooter services. Low water pressure will cause less water to come out of your faucets. It could also cause your toilet to stop filling up normally after flushing. A final sign that your home needs the attention of one of our skilled technicians is if you detect a foul odour similar to that of sewage or rotten eggs coming from your drain. The main benefit of regular drain cleaning or rooter services is that it will extend the life of your plumbing system. The cleaning removes harmful materials that could eventually corrode or damage your pipes and drains. A second benefit is that our services will ensure that your fixtures and appliances are performing optimally. A clean drain has a higher capacity than a dirty or partially clogged drain. Another benefit of regular service visits is that you will save money, because serious problems will be avoided. Regular cleanings will prevent many issues over the years. Regular drain cleaning and rooter services will also keep your bathroom, kitchen, and home free from unpleasant odours caused by waste water and dirty plumbing. Many property owners only contact a plumber when they need a specific repair or upgrade service completed. For example, homeowners may contact our skilled plumbing technicians at M.A.c. Stewart Plumbing when they notice signs of a pipe leak or when they need to replace their hot water heater. However, getting a regular plumbing inspection from our team can provide you with a number of important benefits. What are some things that plumbers look for when doing a system check? A plumbing system check is designed to give property owners a more thorough analysis of the condition of their plumbing system. It includes a detailed review of your pipes, faucets, hot water heater, and other various other units in the home. Cameras inspection and other types of innovative technology are used to look for potential damage to your plumbing system, such as small leaks that may go unnoticed or clogs that are building up in your pipes. We can also inspect the pipes for signs of deterioration that may ultimately lead to a leak in the near future. 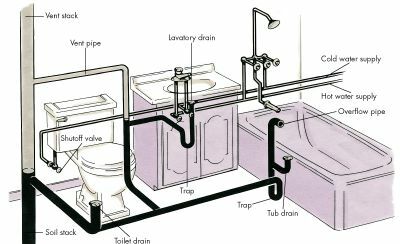 Generally, pipes and plumbing features should be inspected on a regular basis by a well-trained plumbing professional. In most cases, an annual system check is recommended. There are several important benefits that come from a system check with a reputable plumbing company like M.A.C. Stewart Plumbing. For example, we can help you to identify repair issues that you may not be aware of, which can be rectified before they cause water damage, water loss expenses, or even mould growth in your home. In addition, upgrades can be recommended that may help you to save money or that may minimize the likelihood of a repair issue in the future. While there is a cost for a system check, there is a much greater financial benefit that comes from the information you can learn through this service. What are some problems that can occur if you don't have this service performed regularly? Many homeowners may not be aware of damage to the plumbing features inside their residences, unless they schedule regular system checks. They may have unnecessarily high water bills, due to small leaks that have gone unnoticed. They may have a greater number of repair bills because their pipes are deteriorating without their knowledge. There is a higher likelihood of having to deal with emergency repair issues at a moment's notice when you do not take advantage of regular plumbing system checks from a licensed plumber. As a homeowner you want to keep your property well maintained, and having your plumbing system inspected regularly will help you to accomplish this.